Ever since I’ve been overweight in high school, I’ve tried to be careful about what I eat. I feel great now, but staying healthy hasn’t been easy especially when it comes to dining out or eating at the office. It seems like the healthier I want to eat, the harder it is find what I want. Recently, I’ve discovered HealthyOut, an app that uses your current location to recommend specific dishes at local restaurants that meet specific dietary criteria. It’s been great for helping me discover great new restaurants in my area. Now, the app is taking healthy eating one step further by starting a new service in New York City that allows you to automatically arrange healthy food deliveries for an entire week – 5 lunches and 5 dinners. When you sign up for the service, you’re asked a series of questions about any special dietary needs (low-fat, etc.) and what kind of foods you definitely won’t eat. Once you’ve entered your height and weight, HealthyOut will assemble a nutritionally balanced week of meals for you. You’re asked to approve your menu ahead of time so there aren’t any ugly surprises – HealthyOut lets you swap out any choice with an alternative. 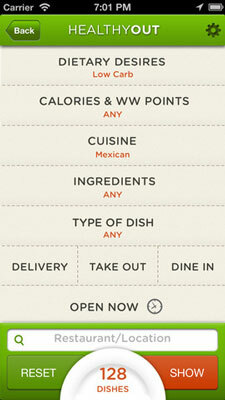 The app will even give you a text alert when your food arrives. The only thing it won’t do, it seems, is eat the food for you. There’s really only one downside, but it’s a major one: HealthyOut isn’t a cheap service. You’ll wind up paying $28 per month for your Monday to Friday meal planning and delivery. And no, that doesn’t include the cost of the food itself – you still have to pay the menu price of the dish, the sales tax, and the tip for the delivery person. Ultimately, HealthyOut could wind up costing thousands of dollars a month. Healthy food, sadly, isn’t cheap. The HealthyOut app is available now for both iOS and Android devices owners across the country. The delivery service is currently available only in New York City, but should it prove successful, you can expect to see it soon in a major city near you. Thousands of dollars a month? Maybe a thousand, for two meals a day if you really want higher end stuff, but then again this is using local restaurants, so it’s probably fresh and tasty. I mean, how much does Jenny Craig or Nutrisystem charge for food that is packaged?